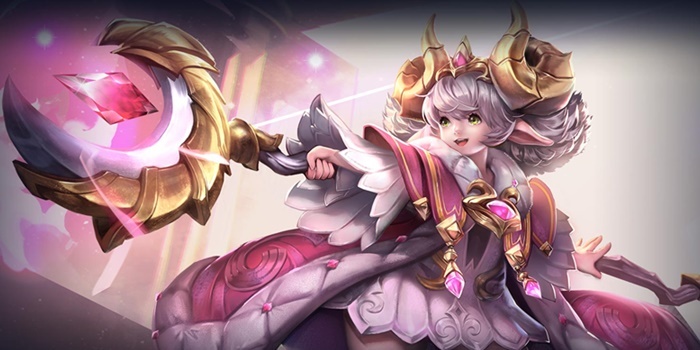 Alice Item Builds Guide for Arena of Valor (AoV). Each build is geared toward a different play style, so choose one that fits your personal preference. The Aegis The Aegis is a staple item for most supports due to its passive and overall stats bonuses. The passive allows Alice to slow the movement and attack speeds of enemies who attack her. It also grants her basic defensive stats, mana, and even a hefty 20% cooldown reduction. This item is a must for Alice. Frosty’s Revenge Frosty’s Revenge compliments her abilities well, adding a slow effect to all of them. It also provides her with magic defense and movement speed which are very helpful in team fights. The item’s passive will allow you to catch up to escaping enemies and better control enemy movement on the battlefield. Wind Stone Whether a support should take Wind Stone or Water Stone comes down to if they will be babysitting in the lane or roaming around the map. As Alice is best suited to running around the map to set up ganks and provide vision for her team, Wind Stone is an obvious choice early. While lacking much value on its own, each of the items that Wind Stone builds into can be huge benefits to the team. The extra gold it provides will help Alice regain what she loses by roaming around the battlefield. Essence of the Wind While each one of the support items can be useful to Alice, Essence of the Wind sticks out both due to how well the stats it provides suit her and its passive that stacks with Friendship. Alice can pull heroes out of tight spots with even thicker shields and a huge speed boost when using both together, allowing for much safer withdrawls. Shield of the Lost Shield of the Lost is another great aura item, especially against enemies who rely on normal attacks and attack speed to deal damage. It also gives her armor and HP which are both vital for survivability. Soaring Aura Soaring Aura is a strong aura item that reduces the magic defense of nearby enemies. A perfect item for when your team has one or two bursty mages that can benefit from an increase in magic damage. Medallion of Troy Medallion of Troy gives you a better chance of survival when facing off against mages. It grants Alice magic defense and cooldown speed along with a shield that absorbs magic damage. Orb of the Magi Orb of the Magi should be your first item when playing Alice aggressively. It gives her ability power and HP, both stats growing as time goes on. It can also help her in the laning phase through the restoration it provides when leveling up. Amulet of Longevity Amulet of Longevity increases her HP and regeneration. While not offering anything to her abilities, it can go a long way in keeping the squishy support up and going in fights. Sonic Boots Build Sonic Boots if the enemy team has a lot of physical damage heroes. Sonic Boots give armor and reduce the damage suffered from normal attacks. This is also a good option if the enemy marksman has snowballed. Gilded Greaves Gilded Greaves is a great boots upgrade for Alice. It provides resistance to help her shake off any control effects she is hit by. This in turn gives Alice a better chance of escaping tight situations. Enchanted Kicks Enchanted Kicks is an aggressive boots upgrade that greatly increases your offensive stats with magic pierce and ability power. This is a perfect item if you want to pressure your enemies with abilities in the early game. This build puts an emphasis on disrupting enemies during team fights. Soaring Aura and Shield of the Lost provide auras that either buff teammates or weaken enemy heroes. This is more of a team-oriented build and is intended for supports who want to provide a clear advantage to allies in mid to late game clashes. This build hardens Alice to outside damage to ensure she survives fights and can control enemies as much as possible. With large amounts of health and armor, Alice will be able to withstand a lot of damage before falling, particularly from marksmen and assassins. As such, she will be able to stick around the front lines instead of falling to the back, affecting enemies with Shield of the Lost’s aura while supporting allies with Friendship and the shield from Essence of the Wind. Here we improve Alice’s impact with additional ability power. While far from being able to carry games with her damage, the damage that she does offer can give her allies an edge in battle. Her shields will also block for more damage as she gains more ability power, furthering her support potential. Frost Cape and Frosty’s Revenge will stack as she controls her opponents, slowing them down to a crawl. Despite this rather offensive focus, Alice will be able to take quite a bit of damage as well. Each of the items outside of Ring of the Fiend offer some sort of defensive boost, giving Alice a lot of survivability to work with. This build makes Alice rather durable while still able to dish out regular disables to assist her allies. Each item outside of the boots will help toughen her skin, making the little girl a surprisingly tanky force on the battlefield. She’ll hit the wonderful 40% cooldown reduction mark, able to throw out abilities as quickly as possible. The short cooldowns and her rather beefy defenses will allow her to keep enemies suppressed all throughout fights. I dont understand the frosty revenge item here. Doesnt alice’s abilities already stuns or slow the enemy? Why would you need another slow or does the slow stacks?? I recommend updating this page and the builds, because there are new items under “support” topic, for sure, Alice needs those items. Please update as soon as possible. Thank you! The support items haven’t come out on any Tencent servers yet. Though they’ve come out on SEA, the names sometimes differ once Tencent releases their “official” versions, so we have yet to publish the items pages, which comes first before revising builds. I hope when it got released on Tencent servers, you guys update the builds and other pages. I am not forcing you guys to update it now, I am just hoping that you update them already as soon as the update comes along. Thank you very much! We certainly plan to! Just be aware that these updates take quite a bit of time given the large number of heroes in the game. Stacking Aegis and Shield of the Lost is not a good idea as their passive don’t stack. They do not stack additively, but you still benefit from both. Shield of the Lost will work on nearby heroes, even if they don’t attack you while The Aegis affects all who attack you without regard to range. Both effects still work if both are equipped, just enemies can only be affected by one at a time. Here stated that the Aegis is her core item. But none the suggested builds above use it. How so? Uhhh, you might want to proof read the support aura build because there is nobShield of the Lost in it. Hi Random, sorry for the inconvenience. We have updated the build with the correct image now.